If you suffer from cilantrophobia and are disgusted by the “bug-infested bedclothes” smelling herb topped on this dish, take a deep breath. The cilantro is optional. I am blessed with Mexican genes that embrace this fresh garnish. Unfortunately, not all foodies feel the same way. Julia Child told Larry King that if she detected cilantro in a dish, she would pick it out and throw it on the floor. Celebrity chefs Ina Garten and Fabio Viviani agree, having publicly declared their hatred for the herb they claim tastes likes soap. The I Hate Cilantro facebook group has more than 10,000 passionate followers sharing cilantro horror stories, and providing tips to help haters enjoy cilantro-free Asian and Latin food. If you’re a hater, keep reading. 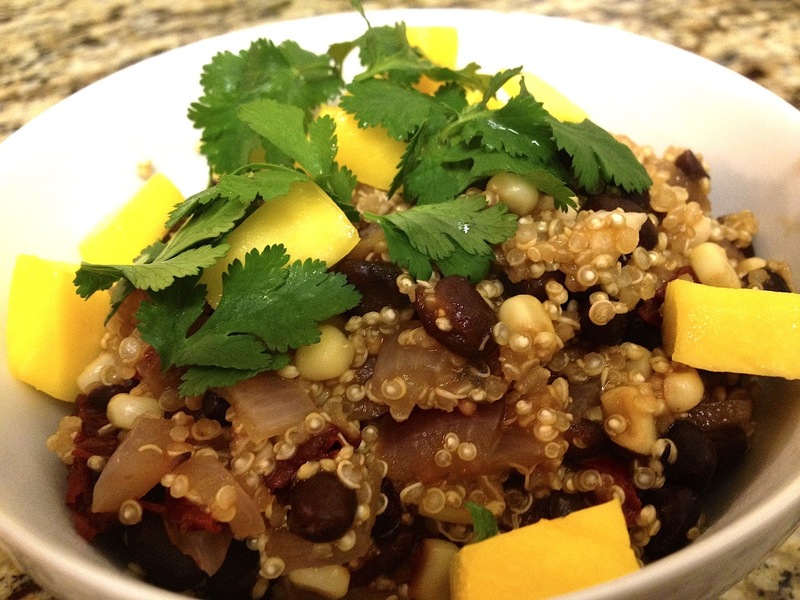 Chipotle Mango Quinoa has a beautiful balance with the spicy chipotle and sweet mango, is packed with nutrients, and has the option of being topped with the controversial green herb. I love everything about this dish. Cheap. Healthy. Quick. Filling. It also happens to pass the three-day cleanse test, and I was not even trying! Coat large skillet with cooking spray and place over medium heat. Add onion and garlic. Cook, stirring until the onion is soft, about five minutes. Add chipotles and oregano and continue to stir for about one minute. Crank up the heat to medium-high, add the quinoa, and sprinkle with a pinch of salt and pepper. Continue to cook, stirring frequently for 3ish minutes. Uncover and check quinoa. If the kernels are still crunchy, add a little more liquid and cook for another few minutes. Top with mango, cilantro and lime. Awesome. Looks filling, delicious, and even good for another cleanse, Cristina!